I am awaiting a batwing fairing for my 06 road star and am wondering if anyone went down this road and what was your results. There are endless options out there: Cd, no Cd, blue-tooth, no blue-tooth, amp, no amp.blah.blah. blah. I just want a system that i can easily hear at 70 mph with stock exhaust. From reading the forums here i have determined that my 06 has the upgraded charging system vs the older bikes, so power consumption should be ok. Any suggestions would be appreciated, thanks. I'd say stay away form CD, they're practically in the same category as cassette and 8-track, plus with all the vibrations, it'd be cutting out constantly while trying to focus the laser. Bluetooth YES!! And an amp is very important if you want clear high volume at highway speeds. There are some cool GPS integrated decks were the screen slides out, it's nice to have if you ever do any traveling. Ideally with Google Maps and Ways compatiblity Plus they just look cool. Also make sure there's a handlebar control option. Minimum for volume and ideally for skip, search, etc. Any hints to max size of amp for this system so as to not overload the charging system? I put a fairing on last summer and I should've installed an amp. I can hear hear at 75 mph but not real good. I got the single Din option but wish I went with the double din. I can still cut it out for one which I probably will. No handlebar controls which would be very nice and something I'm going to get when I upgrade mine. So in short everything Doc said I should've done. FYI- With all the vibrations and exposure to the elements, you should avoid standard car audio equipment. 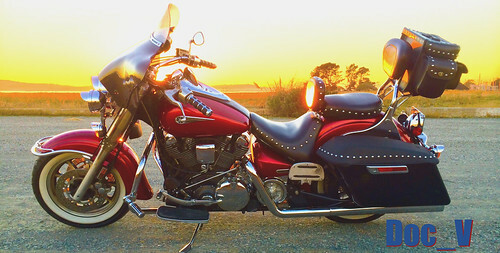 There are a few options that are motorcycles specific, but not a lot and you pay a premium. However, you can use a Marine rated unit. Many of them also come with remotes that can be mounted on the bars. If there's a car head unit you just can't live without, be sure to get a water tight enclosure to mount it in. As for the draw on the charging system, the early R*s were a little on the weak side.I forget the year they made the change, but the later models were rated for a higher output, so you should be OK.
Last edited by Doc_V; 01-26-2019, 12:02 PM. I actually just started looking at a radio with a gps screen and i really like the idea of having an on screen map and hopefully thru the speakers turn by turn directions. If i may ask, what size amp did you go with? I wonder what they make that would allow you to just play a USB stick and not need a radio at all... that's what I want. I think the Stratoliner Deluxe might have had something like this. I can hear mine at 80 with full face visor cracked open one click. By a quality stereo(media player w/fm). I matched the amp to the speakers. Fairing needs some damping material but, its loud! I just got the fairing mounted and am waiting on the radio and speakers. I went with the infinity prv350 and four 5.25 Polk marine speakers. I am going to try this setup without an amp for now, but if i dont get the results i want i will go with an amp. Just waiting on the shipping guy. Very cool, keep the photo coming. Well I took my time and got the radio and speakers mounted up and tested and all sounds good. I haven't road tested it yet but i think i wont need an amp. The radio is an infinity prv350 with 4 Polk 5.25 speakers with a hideaway antenna. For power i already had a usb and cigarette plug there, so i just hooked up a plug to the ground and accessory red wire. So i just plug it in and i'm off to the races. The radio and bluetooth work great and after i put some music on a usb drive. The best thing about this setup is just unplug the 12 volt plug and four bolts and it off in 2 minutes flat. Now to the boring and time consuming part; cleaning up the mess. I dont know why it takes so many tools and i make such a mess doing such a simple job. Does anybody else have this same issue, every tool in my inventory is scattered all over the place. One down side is the windshield, it stands straight up, no rake at all, i hate it. I may have to buy a shorter one so as not to look so dumb. For your info, i could have ordered a complete fairing withe radio and speakers for 680 plus 70 shipping. The radio was 234, the fairing was 180, and the speakers was 119. With nuts and bolts i have 550 total, not including elbow grease. S o i saved myself 200 bucks on the total package and i am well pleased. Thanks for the hint, i am going to google to look for a new windscreen now. I took the bike out for a cruise and the radio is plenty loud enough without an amp, so i am pleased. Everything was rock en great on the first ride with the music blaring when suddenly the rear end went squirrely and i pulled in to a subdivision to check it out. It was flat, so flat the bead was loose from the rim. I obviously ran over something sharp and it went down immediately. Anyway, we jacked up the bike, plugged the leak, aired it up and made my way home. Thank the lord Jesus i wasn't going 70 in a curve, it could have been bad. Glad to hear everything worked out alright... including the flat. FYI, and you probably already know this... but... If the tire came off the bead, it's shot, the sidewalls are toast, you need to replace the bad boy asap. Otherwise it's a ticking time bomb. Thanks for the heads up, i did not know that. I am currently reviewing tires right now and looking to buy. Search the site for threads on tires, lots of good info. Or start a knew one.